This weekend, I was a baking madwoman, experimenting with a couple new Weight Watchers recipes and having lots of fun! One of my baking triumphs was this Maple Pear Muffins Recipe. Each muffin has just 5 Points per serving, which isn’t bad for a carb-based food using sugar AND maple syrup. They were the perfect wintery treat, and were so delicious when served warm with a tablespoon of Brummel & Brown Yogurt Spread. They were sweet, dense, moist and satisfying, and make a great idea for a healthy breakfast on the go. So instead of buying on of those atrociously fattening (and overpriced) muffins at Starbucks, make a batch of these delicious low fat Maple Pear Muffins, and save yourself some calories and some cash! 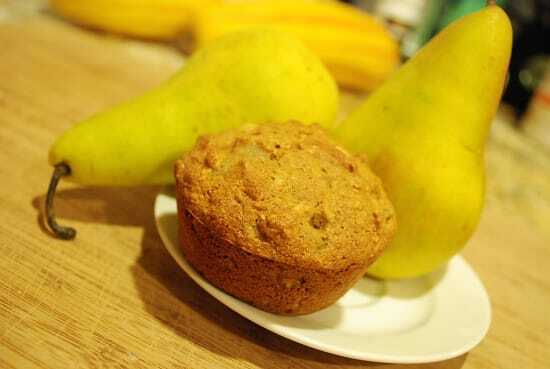 Sweet and healthy Maple Pear Muffins makes a great low calorie breakfast idea if you need something quick. It also makes a satisfying, low fat snack when you are craving something sweet. Spray a 12-cup muffin tin with non-fat cooking spray. In a large bowl, combine together the flour, baking soda, baking powder, salt, cinnamon and nutmeg. In another bowl, mix the pears, oats, sugar, buttermilk, maple syrup, applesauce (or pear puree), oil and egg substitute. Let stand for about 5 minutes. Mix the wet mixture into the flour mixture and stir until blended. Spoon the batter into the muffin pan cups. Bake for about 18-20 minutes, or until an inserted toothpick comes out clean. Place muffins on a wire rack to cool. I was just wondering why you did not use Splenda brown sugar in place of regular brown sugar plus using unsweetened applesauce would be even lower in calories, etc., wouldn’t it or would it make too much of a difference in the way it bakes up & tastes? Thank you for allowing my comments. Great question dawna! You certainly can use Splenda brown sugar in place of regular and will not affect the baking quality. However, I feel that it would give the muffin a somewhat artificial taste. Also, since my toddler eats most of my foods too, I try to avoid artificial sweeteners as much as possible. :) Thanks for reading!